Great leaders are great communicators because they communicate great ideas. Here are 5 things great leaders say when communicating with people they lead. 1. What are your thoughts about __________________? The best leaders seek input from their team. They realize they don’t have all the answers. Even more, they know 1+1=3, so the more input they get from team members, the better an idea becomes. Great leaders always build up and never tear down. They appreciate team players and look for specific ways to communicate their gratitude. In fact, a simple “thank you” is not enough because good leaders know a sincere, personalized compliment is the best way to communicate authentic appreciation. 3. You can improve by_________________________. The best leaders run at challenges and problems instead of running away from them. When an issue needs to be addressed, they don’t avoid it. They address it graciously, but directly. Great leaders don’t see leadership as a position. Neither do they equate leadership with power or control. Instead, they understand their role is to serve the vision of the organization and the people in the organization. This is why the best leaders don’t just tell team members what to do, they also ask team members what they need. 5. I believe in you! Again, great leaders always build up and never tear down. When they see a team member taking positive action, they go out of their way to encourage and praise that team member’s progress. They know the more team members grow and succeed, the more the organization grows and succeeds. Which of these 5 statements is most powerful to you? Why? In addition, what other statements would you add to the list? The inspiration and verbiage for this post came completely from my friend Kent Julian, the founder of Live It Forward. Please check him out at LiveItForward.com. He also has an excellent book on Goal Getting if you need to set goals for the coming year. Shhh! It’s My Quiet Time. In this post I’m assuming you have a regular quiet time. 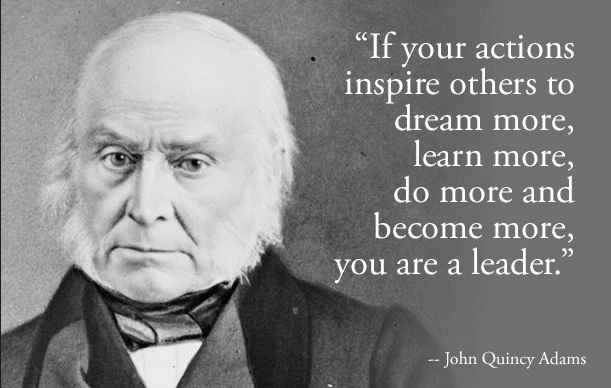 If you don’t, go check out my friend Kent Julian’s post on Leading Your Life from Quiet. So, how do you do your quiet time? I’d love to know, so please tell me in the comments below. In our current state of family, all six of us are crammed into a small apartment. We’re trying out a minimalist arrangement until we decide to build our dream house, so it’s hard to find quiet time here. I also homeschool, so it’s not like I’m shipping them off on a school bus and then enjoying a quiet morning. I have to carve out my quiet time first thing in the morning before anyone else wakes up, which is around 7am. If the kids happen to wake up early, I take my quiet time outside to the courtyard in between apartments. No one is out there in the mornings. I make my 30-in-30 breakfast and sit down with the newspaper. I know it’s old school, but I like the feel of a newspaper in my hands and connecting with the goings-on in my community through that. Then I do my daily Bible reading. I also read a chapter in a Bible-related book. I just finished reading Draw the Circle by Mark Batterson. As I do both of these I keep my journal handy to take notes on things God is showing me. I end this with a prayer time. After all this I take some time to stretch. If the kids are up by now, they often join me. If not, the quiet time lasts longer, and this time of stretching also becomes a time of meditation. Then I’m ready to tackle the day.